The score itself is a numerical reflection of your credit history. It gives lenders a way to discern your reliability before approving a loan like a mortgage for instance. Though this is the basic function of a credit score, it can also have a far-reaching influence over other aspects of home ownership. First and foremost, the status of your credit score is a deciding factor in whether or not you are approved for a loan. Even if you put down a large down payment on your home, a low credit score can still cause the loan to be rejected. For this reason, it’s best to wait until you’ve built up a good credit score before looking to purchase a house. High interest rates are another reason to hold off on purchasing a home until you’ve obtained a very good credit score. While applying for a loan with the minimum credit score required might get the loan approved, it also means having to pay higher interest rates. Shooting for a credit score above the bare minimum before applying for a mortgage will increase the likelihood of receiving a much lower interest rate. A higher credit score demonstrates a credit history of timely payments and the ability to successfully pay off debts, which are key factors in mortgage approvals. An insurance broker running a credit check might seem a little out of the ordinary, but in actuality when is comes to home insurance, companies frequently run credit checks on prospective clients. When an insurance company inquires about your credit history, all they receive is your credit score and nothing more. The nitty-gritty details of your credit history remain private. So, why are insurance companies running credit checks in the first place? 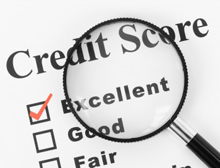 Credit scores are an integral part of the scoring system they use to determine premium rates for each client. Though your credit score might seem irrelevant in determining how likely you are to file an insurance claim, the industry argues that there is a documented connection between those who are more likely to file insurance claims and the lowly state of their credit scores. This trend has led insurance providers to offer higher insurance premiums to those with lower credit scores. In some cases companies may refuse to insure a client based on a poor credit rating. Credit scores have a profound influence over financial transactions. You ability to make a large purchase like a new home can be severely hindered by a poor credit score. If you have a low credit score, consider taking some time to repair your credit history before applying for large loans. Correct any lingering errors on your credit report and get into the habit of making consistent, timely bill payments. Addressing these issues could dramatically improve your credit score in a year’s time, putting you in a much better position to tackle home ownership. For home buyers in Hendersonville and nationwide, credit scores can change low mortgage rates and alter home loan approvals.